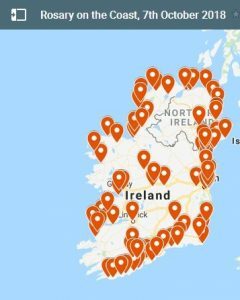 Rosary on the Coast locations in Ireland yesterday. The head of the Catholic Church in Ireland has added his voice to Pope Francis’s call to the faithful to pray the Holy Rosary every day during the month of October. Archbishop Eamon Martin of Armagh said that Ireland has a long tradition and devotion to praying the Rosary within the family. The Archbishop was speaking from speaking from Rome, where he is attending the Synod on Young People, Faith and Vocational Discernment. Archbishop Martin pointed out that in Ireland and in more than 40 other countries across the globe, people were gathering at coastal and border locations to recite the Rosary together for Life and for Faith. Organisers of the international Rosary on the Coast initiative described it as an attempt to form “a Holy League of Nations”. As reported last week by CatholicIreland.Net, as well as calling for daily recitation of the Rosary this month, Pope Francis is asking that the faithful conclude their recitations with two special prayers. During the recitation of each decade of the Rosary – comprising the Lord’s Prayer, ten Hail Marys and a Glory Be – Catholics focus on Mysteries, or elements of the life of Our Lord and Our Lady. Since the time of Pope Pius V in the 16th century, there were 15 Mysteries grouped into three sets – the Joyful Mysteries, the Sorrowful Mysteries and the Glorious Mysteries. However, in 2002 Pope John Paul II added a new set of five mysteries, the Luminous Mysteries. Often, when people recite the Rosary, they offer particular intentions before each decade to ask Our Lady to grant a favour, said Archbishop Martin. These intentions may be to heal a sick person or convert a sinner, to help and guide in times of trouble, illness, financial difficulties, seeking employment or to ask for her help when studying for exams. The Archbishop said intentions are as varied as the people who pray. “Our Lady loves the prayer of the Rosary. She wants to hear and grant our petitions and requests. Sunday, 7 October was the Feast of Our Lady of the Rosary.